Last year’s big DC/CW crossover, “Invasion!” was a triumph, uniting the heroes of four comic book series for a massive adventure that was fun while furthering each of the show’s arcs (some more than others). It also managed to leave behind most of the shows’ individual weaknesses and, in some cases, make the characters more engaging than they are when playing solely in their own sandbox. It was a given this would become a yearly event, and last week the new season brought us “Crisis on Earth-X,” the new massive DC superhero team-up. This time they went bigger, encompassing an episode of all four shows instead of just three and creating a true miniseries instead of just a big crossover. All of the major characters from the four DC shows (well, just a few from Legends of Tomorrow) converge on Central City to attend Barry and Iris’ wedding, bringing their own hardships with them as they cheer on the world’s most perfect couple. But just as the bride and groom are about to make it legal, the church – and Earth-1 in general – is invaded by Nazis from an alternate universe! Turns out they’re the rulers of Earth-X, a world where Hitler won World War II and the Third Reich has had an iron grip on the globe ever since. Now it’s up to Earth-1’s heroes, plus Supergirl, to save the world from a threat long-thought gone. Having Barry and Iris at the center of the story could have turned sappy, and the writers wisely avoid that by using them to highlight the various heartaches of the other characters. Kara lost Mon-El, and now that he’s back and married, she’s got to watch another woman live out the future she wanted with him. Her sister Alex has also just lost the love of her life and would rather drown her sorrows at the open bar than toast the about-to-be-newlyweds. Oliver and Felicity seem happy, but when Ollie is spurred by the wedding to propose to the woman he’s Ross-and-Racheled with for several seasons now, he finds things may not be as happy as they seem. Professor Stein and Jax, while not a romantic couple, are facing a breakup of their own as they attempt to separate themselves so Stein can retire, and Jax’s pangs of loss are stronger than he lets on. All of this is to say, Barry and Iris are the exception, not the rule, and true love doesn’t work out for everyone. This is a great theme because it not only allows the rest of the heroes to develop during an event that isn’t really about them, but it makes Barry and Iris even more special. Happiness is elusive and love can go wrong in a million ways, so you’ve got to grab it when you can and enjoy it while it lasts. What the others don’t seem to understand, though, is that Barry and Iris weren’t always like this. There was plenty of longing and drama and true sorrow before they were finally able to get together. The rest have turned these two into a fairy tale, but the truth is that they worked hard to be together, and they still work hard to stay that way. One by one, the other couples come to see that. Oliver decides he’ll take Felicity any way he can get her while Felicity realizes that her fears about getting married to Oliver aren’t something to be avoided, but something to be confronted head-on with the man she loves. Alex decides to trust her own instincts and look forward to finding someone who wants the same things she does instead of obsessing over someone who doesn’t. Jax loses Stein for good, and instead of clinging to the only father he ever knew, resolves to carry the other half of Firestorm in his heart forever, while Stein lets go not by forcing a new persona on Jax but by saving his life one last time and allowing him to forge any future he wants. Kara… well, not much happens there, really. The whole Mon-El thing is pretty much dropped after she mentions it to Barry. On the one hand, this is a misstep that leaves one of the major players out in the cold thematically, but it doesn’t bother me that much because I never understood that pairing and, as such, am not particularly invested in it. (Seriously, can anyone tell me what these two see in each other aside from both being pretty aliens?). The main villains are part of this theme themselves. 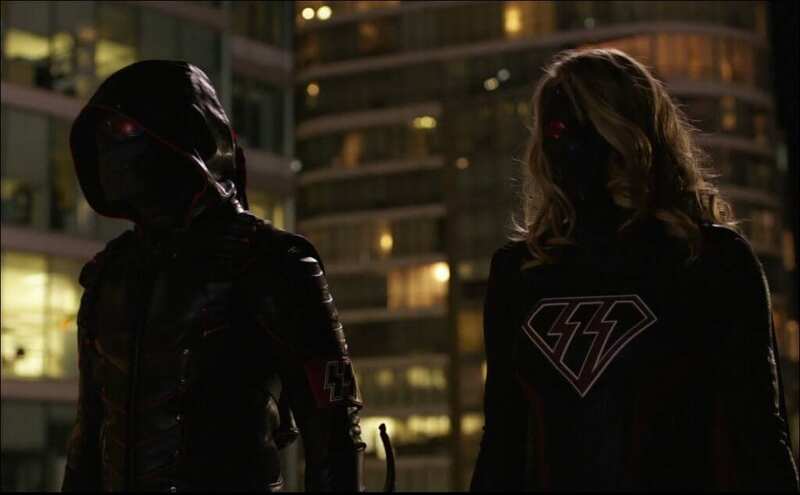 Evil Earth-X Nazi Oliver Queen and Evil Earth-X Nazi Kara Danvers aren’t just the leaders of a fascist dictatorial regime; they’re husband and wife, and the true reason for their invasion of Earth-1 is not conquest, but Nazi Oliver’s determination to save Nazi Kara’s life. In attempting to make herself even more perfect, Nazi Kara absorbed too much solar radiation and is now dying. The only way to save her is to take Supergirl’s heart and transfer it to her Earth-X counterpart. This is what makes these two such wonderful villains: they’re human. Nazi Oliver really, truly loves his wife, and he’s willing to do anything to save her. He even, in the end, offers to spare Earth-1 if the heroes will just give up Supergirl, choosing his wife over his Reich. He is unable to let go, like Jax and Alex, and his determination to be the perfect couple – the Barry and Iris of superpowered alternate universe Nazis – brings about his and his wife’s demise. That they were able to make Nazis sympathetic is a real feat, and proof of what these writers are capable of. That makes it all the more frustrating that they just couldn’t resist taking a big swipe at President Trump. The DC shows have been moving further into social justice warrior territory (save Supergirl, which was always dripping in left-wing politics), and once the initial fight against the Nazis is over, the heroes have a big rap session where they talk about how Nazism is alive and well, and Jax uses the phrase “Make America Aryan Again.” Later on, there’s talk about “punching Nazis,” a slogan Antifa uses to justify its violence. Was this really necessary? Can’t anything just be fun anymore? And it makes no sense anyway, as these Nazis are the legit, Hitler-led Third Reich Nazis, not the ones who are haphazardly assigned the label for being anywhere to the right of a hippie commune. If superheroes get into politics, it should be in a general way, talking about larger ideas. Civil War, for example, is about individual rights vs. government regulation, not about who you should vote for in any given November. That marks the difference between subtext and just plain text; using actual Presidential campaign slogans and stopping the entire plot cold to preach to your audience turns what should be a fun show for everyone into a smug lecture. I actually watched the first two episodes a second time, and was bothered less about it when I knew it was coming; and, thankfully, it pretty much goes away after that initial group therapy session for the writers/producers. From there on, the imagery is starkly the real Nazis, and it’s very effective. I also liked the strong emotions they elicit from Felicity, who is a descendant of Jews who suffered through the Holocaust. To think that there is an Earth out there where the people who tormented her family and her people won and continue to thrive is horrific for her, and it’s through her more than anyone that we see the true extent of their evil. When the heroes are captured and sent to Earth-X as prisoners, they’re deposited in a prison camp not unlike those run by the real Nazis, and again it’s very unsettling. Earth-X looks like a lost cause, and the thought of that nightmare coming to our world raises the stakes considerably. Also raising the stakes is the big death of Professor Stein. 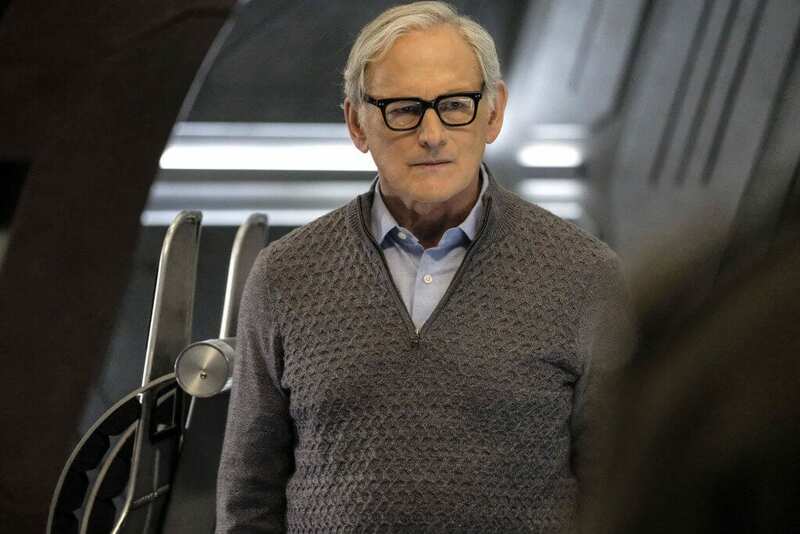 I love this character, and Victor Garber in general, and I’m sad to see him go (Legends of Tomorrow really can’t afford to lose any more good characters), but his exit was handled beautifully. The tragedy of a man so close to happiness being robbed of it because he can’t help but be a hero is such a wonderful tribute to Stein, and the peace he finds in making sure Jax will be okay warms the heart just before breaking it. Franz Drameh’s acting in these scenes is his very best as Jax; I don’t usually care for him, but he’s great when having to say goodbye to Stein. In addition to the political nonsense, my other major sticking point with “Crisis on Earth-X” is with the third in the villain triumvirate, Reverse-Flash. It’s not the character himself that’s the problem; Reverse-Flash is still my favorite DC/CW villain (and that’s a rogues gallery that includes Manu Bennet’s Deathstroke! ), and I was happy to see him played again by Tom Cavanagh, who once more kills it in the part. My issue is that his role isn’t developed as fully as it ought to have been. This isn’t an Earth-X doppelganger; this is our world’s Eobard Thawne, reborn once again by extracting himself from the timeline to avoid certain death (and I’m so happy about that; it didn’t sit well with me that Barry wasn’t even present for his demise on Legends). Why is he helping the Nazis? I can’t imagine he’s suddenly a believer in the ideals of the National Socialist Party. I was hoping for a scene where he explained to the good guys that he was manipulating Nazi Oliver and Nazi Kara into conquering Earth-1, after which he would get rid of them and rule two worlds all by himself, with the option to expand in the future. But a motive is never mentioned. I also hate that Barry just lets him go at the end. I understand Barry won’t kill him because morals, but at least lock him up. Thawne will undoubtedly kill many more people now, and he’s already promised to come back and plague Barry some more (which, don’t get me wrong, I’m giddy to see). Shouldn’t there be some attempt to keep society safe from the most evil man in the world? The rest is great. I love the action, especially those huge battle scenes that look like comic book splash pages (reminiscent of Legends of Tomorrow’s first season, when that show was actually good). There’s some excellent humor as well, much of it provided by Mick Rory (“I hate cops. And lawyers.”); although the standout punchline has to be Oliver, when arriving to a fight scene via motor cycle long after super-fast Barry and Kara have landed, telling his metahuman buddies, “Just a quick reminder. Super speed. I don’t have it.” I also got a charge from Supergirl facing off for the last time with her Nazi doppelganger by saying, “General, would you care to step outside?” Why can’t she be half this fun on her own show? And finally, I loved the joint wedding at the end. “Invasion!” ended with Oliver and Barry sharing a drink as friends, and I was really happy the last moment was with the two of them; this felt like a nice compliment to that, with the two main heroes both marrying the loves of their lives together, solidifying their friendship even further. It’s sappy, it’s corny, it’s girly, and I loved every second of it. “Crisis on Earth-X” is a great time, another fun crossover in what I hope will be a yearly tradition for a long time to come. But next time, please leave the politics at the door.